How many National Parks have you visited? Which one is your favorite? Here is a view from ROCKY MOUNTAIN NATIONAL PARK in Colorado. National Parks feature some of the most amazing sights and opportunities to view wildlife. On a recent hike in Rocky Mountain National Park I spotted these wonders. Why not celebrate the Centennial of our National Parks by visiting one soon. You’ll be amazed. April Chu: On Illustration, Art, and Picture Book Success. I had the pleasure of meeting picture book illustrator APRIL CHU at the 2015 American Library Association Convention in San Fransisco (ALA). We shared a table and signed books for our publisher CRESTON BOOKS. Since then, April’s books have been earning recognition for the beauty and distinct quality of her illustrations. Here she is to talk about her process and how the books came to be. Tell us a bit about your background and art training. I studied architecture at UC Berkeley and worked as an architect for over ten years before I decided I wanted to be a children’s book illustrator. I never had any formal art training, but I don’t think I went a day in my life without doing some sort of doodling. 2. What brought you to illustration? I’ve always loved drawing but I didn’t know how to channel that into something I can do professionally. Then in 2009 I took a children’s book illustration course at the UC Berkeley Extension and I fell in love with the whole book making process. A few years later, I decided to pursue illustration seriously. 3. Two recent books you’ve illustrated – A VILLAGE BY THE SEA, and ADA BYRON LOVELACE AND THE THINKING MACHINE – are with CRESTON BOOKS, which happens to be my publisher as well. How did you end up working for Creston? I met Marissa Moss at a book party that she was hosting. She had just started up her press, Creston Books. I brought along my portfolio and she thought I’d be a good fit for a manuscript she had just acquired called IN A VILLAGE BY THE SEA (Muon Van, author). I read the story and knew instantly that that was the project for me! After completing the artwork, Marissa offered me another book. This time it was an intriguing biography about the world’s first computer programmer, Ada Byron Lovelace. Working with Marissa and Creston Books has been such an amazing collaborative effort. I hope there are many more collaborations to come! The books mentioned have been earning a lot of praise and well-deserved starred reviews. How has that changed things for your career? It has been great! I am usually working on my artwork alone and I only really get feedback from my editor and my husband. So once the book is released into the world, it’s such a relief and wonderful feeling when it’s welcomed with such warmth and positive attention. As an illustrator, the reviews and feedback definitely help me stay in the business. 5. I adore your illustration. They are so richly textured and three dimensional. I feel like I can touch the drawings and everything will come to life. Tell us a bit about your process. Thank you! Before I begin sketching, I will read a manuscript many times so that I can do some initial brainstorming. For nonfiction stories like ADA BYRON LOVELACE AND THE THINKING MACHINE (Laurie Wallmark, author) there is usually some extensive research involved. After brainstorming and researching, I begin working on the thumbnail sketches, then the book dummy, and then the final sketch. This process can be quite lengthy with lots of revisions along the way. To create the final art, I scan the final pencil sketch into the computer and color the image digitally. I usually wake up whenever my 6 month old wakes up, which is usually pretty early. I take care of her and then have a cup of coffee and something healthy for breakfast. I try to sneak work in while she naps which can be half an hour at a time or a few hours at time. My husband helps out when he’s home so I can get some extra work done, but usually I am pretty exhausted by then. Basically my work day currently revolves around my daughter! I am still getting used to the new mommy routine and I don’t really have a typical work day anymore. Any words of advice for would-be illustrators? My advice would be to have a good website with a solid portfolio. And try to get your work out there and don’t be afraid to network! You never know who you are going to meet. It could lead to your next job. I am working on my next picture book about America’s first female detective, Kate Warne. The story is written by Marissa Moss and the book will be published by Creston Books and released Spring 2017. Then afterwards I am illustrating a sweet story about a boy going on a fly fishing trip with his grandfather. This book will be published by Abrams and released Spring 2018. When I am not illustrating, I enjoy traveling and spending time with my family. Bake it Forward: Make Some Treats and Help Feed the Hungry. Help the Food Network and No Kid Hungry serve 1 Million Meals to children in need this holiday season. Sign on to the Bake it Forward Promotion. Maximum donation of $100,000. Promotion runs 11/1/15 12:01 am ET – 12/31/15 11:59 pm ET. Void where prohibited. ½ C. granulated sugar. 1 C. water. 1-1/2 tsp grated lemon peel. 2/3 C dark brown sugar. 1 ½ C. old fashioned or quick cook oatmeal (not instant). 1. Heat oven to 350 degrees. Line an 8 x 8 inch pan with foil. Grease or spray foil with non-stick spray. 2. Filling: Place diced fruit, sugar and water in a saucepan over medium heat (NOTE: parents should assist children with this step). Bring to a boil, stirring occasionally. Cook for 12-15 minutes, until thick. Watch carefully toward the end; mixture may bubble and splash! Stir in lemon peel. Cool to lukewarm. 3. Crust: Mix the dry ingredients in a medium bowl. Stir in melted butter until well blended. 4. Remove one C. of crust mixture for later. Press the remaining amount evenly into the bottom of the prepared pan. Spread the fruit mixture over this. Then Sprinkle the reserved crumb topping evenly. Press gently into an even layer. 5. Bake 40-45 minutes or until bubbles form around the edges of the pan. Cool on a rack 45 minutes, then cover and cool in refrigerator at least 4 hours. 6. Turn onto a cutting board. Peel off foil. Cut into bars with a sharp knife. These bars can be stored in the refrigerator in an airtight container for a couple weeks. Why not join the Food Network and No Kid Hungry and make something delicious to share this holiday season. Happy Thanksgiving to all! We’ve had a cold winter in southern New Jersey. Those who live here have learned to acclimate or move elsewhere. Have you ever thought about the animals or birds that live in the cold, snowy climate and thrive there? Do they ever move elsewhere’? The snowy owl , also known as the Arctic owl or great white owl spends most of its time living and nesting in the Arctic tundra of Alaska, Canada and Eurasia. Comparable in size to NJ’s great horned owl, it has much more body fat that keeps it warm and allows it to live in the coldest regions on earth. In a very good year of hunting, a snowy owl will eat three to five lemmings, rabbits, mice or birds a day. Most owls hunt at night making them nocturnal but the snowy owl is diurnal which means it hunts during the day. When there is a good supply of food , the owl will lay more eggs and produce more young. So the size of the clutch of eggs is totally dependent on the abundance of food. 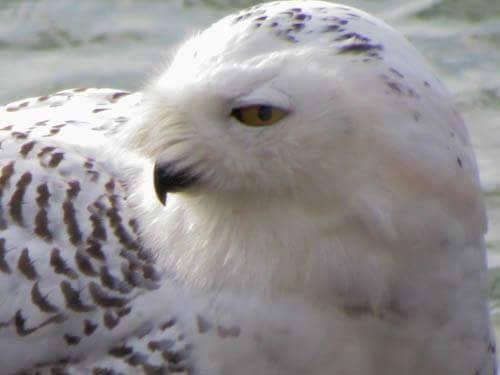 Author’s photo of the Snowy Owl taken at Island Beach State Park, January 2105. “Irruptions” are when larger than usual numbers of snowy owls venture beyond their normal Arctic habitats. Scientists suspect that the larger population of juvenile snowy owls traveling further south is also a result of an increased number of young born and fledged and then the ensuing competition for food. During the winter of 2013/14, the snowy owl migrated south and many stopped in NJ much to the delight of bird watchers. “It’s a natural spectacle, like a meteor shower, something you should see,” said Pete Dunne, New Jersey Audubon’s director of communications. 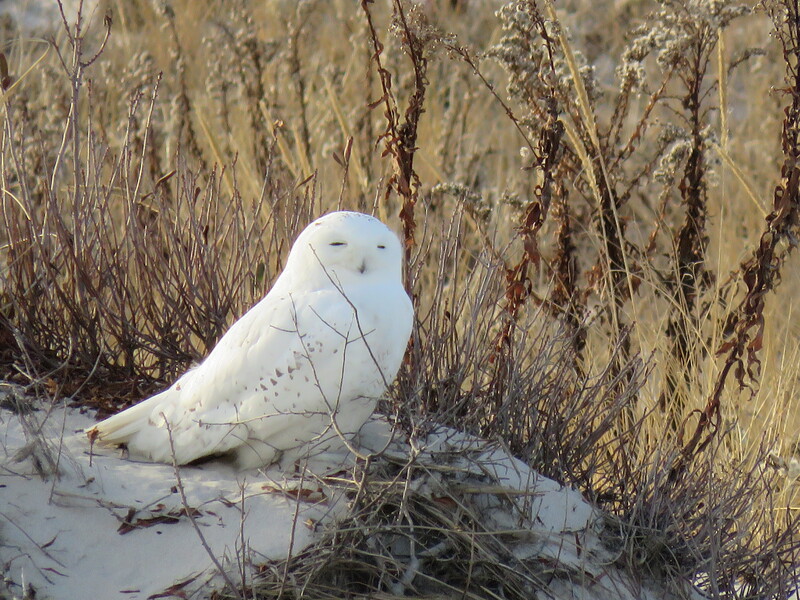 This December and January, sightings of the snowy owl were once again being observed at the the Edwin B. Forsythe National Wildlife Refuge http://www.fws.gov/refuge/edwin_b_forsythe/ and at Island Beach State Park http://www.islandbeachnj.org/ Both locations are along the New Jersey coast.